You found a fairly nice apartment in a small building or house with an in-law unit. You moved in. When you applied for the place you spoke to the owner who lives in the in-law unit downstairs. He seemed nice enough, maybe a little nosey, but you understood. He lived in the building and wanted to make sure you were going to be a good tenant. It is unlikely that he told you the reason he lived in the in-law was that he couldn’t afford to live anywhere else. That his quest for the American dream to own his own property stretched him so thin he had to move into the garage. Your landlord’s dream could become your worst nightmare. Beware. You may have a troll in the basement. A landlord who lives in his own in-law unit is usually so penurious that you can hear him squeak when he tiptoes up to your door to eavesdrop—the ultimate Cheese Ball. What does that mean to you? Well let’s put it this way: When the roof leaks, it doesn’t matter because it isn’t leaking on him yet. Trolls love to visit you whether you’re at home or not. Many illegal entries are perpetrated by troll landlords. Why not? They have a key and you have a life. The anally expressive guy two posts back was a troll in the basement. Another troll permutation is the alcoholic brother-in-law—the landlord’s down and out friend or relative. The landlord lets the troll live there because he, allegedly, feels sorry for him. Sometimes he tells the troll he can manage the place. Not the brightest strategy when there are paying customers upstairs, unless they’ve been paying too long. The only thing this type of troll can manage is his hangover. Yet, he’s the King of the Crawlspace and he won’t let you forget it. If he comes around to collect the rent, please don’t pay him in cash. All bets are off after you start to register your concerns with a troll. He takes it personally. Then things start to happen. Suddenly you have too many roommates. He has to come inside the unit day after day to “inspect” things. You didn’t have permission to paint the place. You don’t get to park in the garage anymore. You have to tear out the wonderful garden you planted in formerly barren back yard. Weird chanting and screaming jars you awake at night. And then the surly threats, occasionally followed by violence. 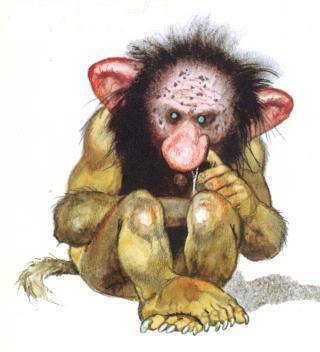 What can you do about a troll in the basement? I had a client who was paying very high rent in Cow Hollow. The tenant/friend of the landlord lived in the illegal unit downstairs. After he made her life a living hell, she called the Department of Building Inspection. They made the landlord remove the illegal unit. The tenant had to go. Her life is very peaceful now. Her story is rare. • If you live in a rent controlled jurisdiction you can file a petition at the rent board for decreases in services. • You can sue for harassment and breach of the warranty of habitability, etc. • You can try to get a restraining order, but that can be difficult because the troll lives in the same building. • You can, and should, call the cops, if you have to. Troll landlords are crazy. Sometimes I wonder how crazy because it’s a perfect ploy to get rid of rent-controlled tenants. Remember you’re still just the tenant and the troll owns the joint. Often, nothing short of incarceration will get him to stop. I’m going to take off my lawyer hat here. Yes, he has to learn that he can’t get away with this. Yes, you have rights. How long can you live with the daily harassment? Insanity is contagious. But the rent is really cheap. You can’t afford to move. Say what? The troll can’t afford to move either. You are never going to own the place. Don’t act like you’re locked into a karmic reincarnation battle that began 100,000 years ago when your high-priestess mother sacrificed you to the God of Cheese. Get out! Run! Run now! Besides, you will get one more legal shot at the troll in the basement. They never return security deposits. Just found out that landlord got a code violation from the county for inhabitant structure building without permits and converting barn structure to living quarters illegally. They received letter in Sept and they have,not giving us a copy or notice of the violation instead they have us a3 day notice. There are 5 families and a mainttenance guy who lives in a shack with no water. They have harrassed us and even shut our pg& e and threaten to turn off water. We have not received a unlawful detainee and I called the county and talked to the inspector he advices me to get a lawyer. Can u help? Thank you so much for speaking with me yesterday about my issues with my landlord in Pacifica. I read the above article as you suggested, and, not surprisingly, it describes my troll in the attic to a t! I greatly appreciate the time you spent with me on the phone as well as the suggestions you gave me. We’re crossing our fingers for a good outcome! Just got off phone with you and you directed me to the TROLL. Omg this is so my situation except for the drunk. You gave me a good laugh, so much better then after getting my summons at 8pm last night and having a cry fest. Thank you it was a pleasure to talk to you!